R&B crooner and all around smooth dude Miguel served as the musical guest on The Late Late Show with James Corden last night (February 24), delivering a live performance and having a chat with the late-night host. The pair discuss Miguel's recent surprise return to his middle school, his upcoming wedding plans and his new remix EP, which arrives tomorrow (February 26). 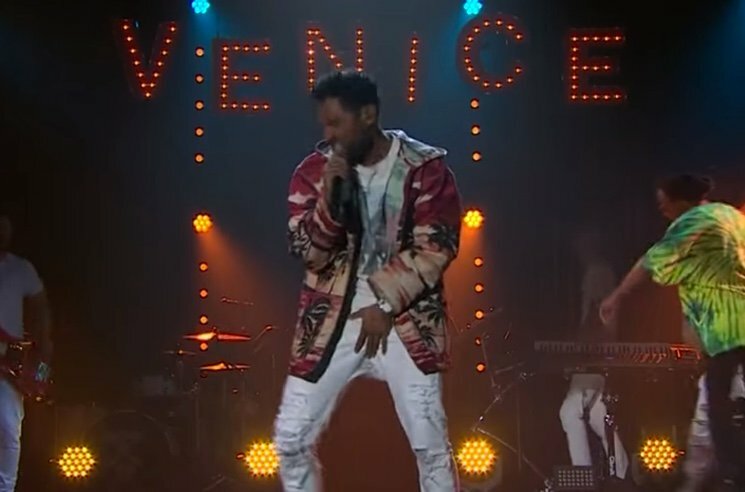 Rogue Waves features five reworked versions of "Waves," featuring the likes of Travis Scott, Tame Impala and Kacey Musgraves, so it's only fitting that Miguel performed that same song for the studio audience. Miguel and his fleet of back-up dancers upped the show's energy level tenfold with a smouldering live rendition of "Waves." It doesn't take long for the singer to ditch his fringed mic stand in favour of showing off his own moves. Check out the interview and performance in the players below.